Suffolk Transit has suspended bus service throughout Suffolk County for Monday, Oct. 29, 2012. MTA.info says six garages are out of service due to flooding. I hope everyone down there is safe and things return to normal quickly. I hope everything other than what might have been up on lifts was moved over to the mainland from the MTA's Rockaway Garage in time because, for sure, it was inundated! Ever since talk of global warming became a serious subject (no comment here as to whether or not there is such a thing) they've been discussing the vulnerability of lower Manhattan in the 'perfect storm' but I never thought I'd see it happen in my lifetime! There are a lot of lessons to be learned here with not the least of which being the ramping up of the entrances to the Brooklyn Battery Tunnel (or what ever it's called now) so water has no chance of flooding it again - that would be a cheap fix too! 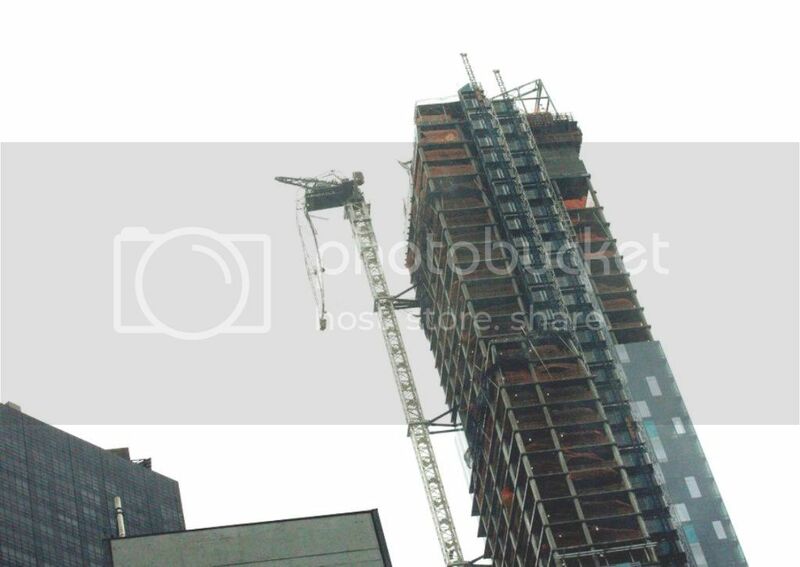 BTW; that crane boom that went wild and is now hanging precariously nearly 1000 feet above 57th. Street is even more dangerous than it looks. The full weight of the cab and its heavy Diesel engine, weights and spools of cable behind it are now unbalanced causing great strain to the pivot assembly it is attached to and could snap at any time! (see attached photo). It's going to be interesting to see how they're going to negotiate its removal - whatever is decided, it better be soon! My thoughts and prayers are with everyone who is suffering a little or a lot right now from Sandy's wrath. The scenes of devastation from the Jersey Shore to Staten Island to Hoboken are heart-wrenching. I know those folks may not be able to read this message right now, but the thoughts of our nation are with you. Take care and be safe. Far Rockaway flooded real bad. Anybody know what's happening in Atlantic Beach (NY)?. With Long Beach and the Rockaways devastated, I can only imagine the damage in between. I have an interest there and I've tried to reach the Village office by phone without success. Our houses are pretty solid and our boardwalk has survived many hurricanes merely because it's three times the height of the one in Rockaway and at least twice that of Long Beach's (the wooden cabanas though along the shore line are another story - they're always the first to go!). Old timers used to tell us that the last time Reynolds Channel and the ocean met in Atlantic Beach was 1927 and that was at the low lying east end. I'm hoping everything survived as I am hoping that all who read this are safe and sound. Tomorrow is Saturday and I will (as I am sure our Rabbi will) ask God to bring rapid relief to those who are suffering from the ravages of the storm. There is nothing mentioned on the TV as Long Beach is getting all the publicity. There are blocks that have so much sand washed on them people are using snow shovels to clear paths and the front end loaders to clear streets. With Atlantic Beach being next to Long Beach I can't imagine them faring any better. The LIRR Long Beach Branch was washed out so I think the damage will hit everyone. Riggers finally secured the boom of a tower crane blown loose from a residential high-rise project on West 57th. Street in Manhattan during Hurricane Sandy. The city Department of Buildings and crane owner Pinnacle Industries spent 36 hours slowly turning the giant cab assembly and main mast sideways at the top of the ninety story structure so the 150-foot boom could be tethered to the side of the still unfinished building (see photo below). The city said the boom flipped over backward as winds peaked at 80 mph and then swung precariously in the raging storm, but somehow stayed tied to the mast. A city official who asked to remain anonymous said that in all probability the accident was as a result of operator error in failing to place the boom against the roof of the building in anticipation of the predicted storm, and that a full investigation will begin immediately. Engineers have now been left with the daunting task of removing the incapacitated assemblage piece by piece which will be accomplished by constructing a derrick on the roof of the building. As a precaution, the city had shut down West 56th and 57th Streets between Sixth and Seventh Avenues and announced Sunday evening that it would reopen the streets on Sunday night except for two lanes on the north side of W. 57th St., closest to the crane. Some of the affected residents in the area were allowed back to their apartments last night. 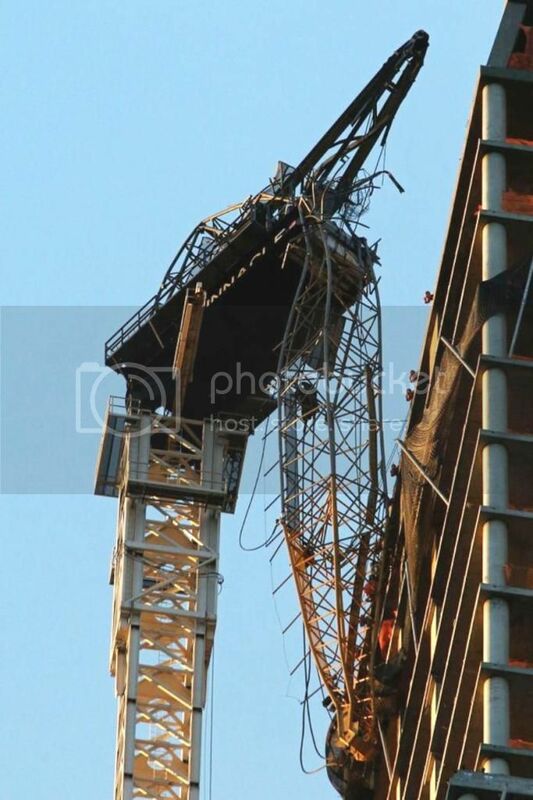 The self constructing tower cranes, which are of European design, have been used successfully in the U.S. for several decades and this mishap is a rare incident. When charlie hit us none of this type of crane buckled like this. We had higer winds here. (100 mph + ) One of the things that they do with this type of crane is put it in a freewheel mode where it swings with the wind. This was in a newspaper story because people were wondering if something like this could happen.